The NIAS-Lorentz Theme Group Capturing Phylogenetic Algorithms for Linguistics explores how a computer can be used to calculate the history of languages. The group members will carry out their intensive interdisciplinary collaboration project from 1 September 2015 until 30 November 2015. For centuries, linguists have reconstructed trees from contemporary data (words, sound changes, grammatical features) on languages. The trees reflect the historical dispersion of the languages and are our only reliable source on the prehistoric movement of the populations involved. 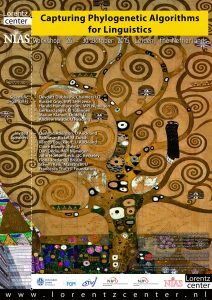 The most well-known such tree is the Indo-European family tree, underlying hundreds of geographically disparate modern languages, such as Afrikaans, English and Hindi. Language family trees have traditionally been reconstructed manually by humans. But key parts of the tree-reconstruction, i.e., looking up words in a dictionary, weighting of evidence for millions of alternative tree scenarios, etc. are better suited for a computer. Only now, in the digital age, are both computational power and large linguistic datasets available, making it possible to take the quantum leap. But the field harbours up a rich set of modelling problems and corresponding algorithmic challenges. This NIAS- Lorentz Theme Group will address these, combining expertise from bioinformatics, algorithm theory and linguistic data. The workshop Capturing Phylogenetic Algorithms for Linguistics is held from 26 Oct 2015 through 30 Oct 2015 and brought together linguists, biologists and mathematicians.